This past June, Eco-Justice Collaborative partnered with the Feminist Task Force, Pilsen Environmental Rights and Reform Organization (P.E.R.R.O. ), Citizens Against Ruining the Environment (CARE) and the Loretto Community at the United Nations to bring the second gender and climate justice tribunal taking place in the United States to Chicago. The first took place in Appalachia in May. The tribunal took place in the Chicago neighborhood of Joliet, and featured the testimony of women from Chicago neighborhoods of Romeoville, Lockport, Little Village and Pilsen. This tribunal – a mock trial – highlighted impacts on women and their communities realized from living with air pollution generated by MW Generation’s coal plants in Joliet and Romeoville and the dumping of toxic coal ash by MW Generation in a nearby unlined quarry. The tribunal also underscored the importance of cleaning up heavily polluted sites after power plants are closed, using MW Generation’s Fisk and Crawford as examples. Experts framed each case. Women shared their experiences and stories, and judges rendered a verdict of GUILTY along with recommendations that were taken to Rio +20 Earth Summit and linked with those from tribunals held in 15 other countries. Jurists include Salvadoran human rights activist Marta Benavides and Jacqui Patterson, NAACP’s Climate Justice Initiative. Our two-page program identifies expert witnesses and women who testified. Some of the jurists recommendations can be found in this two-age report prepared by the Feminist Task Force. These Chicago women from different backgrounds and neighborhoods, have all been witnesses to the harmful impacts of coal on their lives, their communities and their neighborhood. 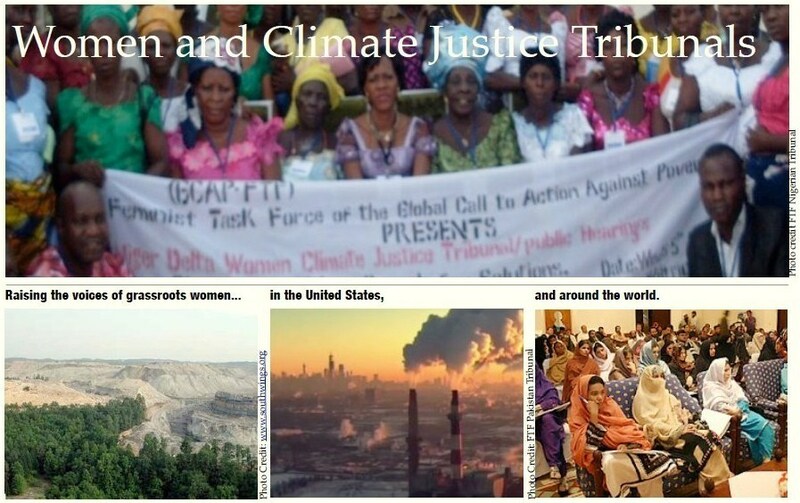 The Chicago Women’s Tribunal on Climate Justice ensured the voices of urban grassroots women reached the corridors of power at the local, national and global levels. This Tribunal also made space for networking and collaborating to work together to end coal pollution in the Chicago metropolitan area. The tribunal follows a long line of women’s tribunals spearheaded by the Feminist Task Force and organized around the world since 2007. The Tribunals have been used to create a public space for women to draw attention to critical issues at the local, national and global levels. They provide an opportunity for women directly affected by poverty, climate change and gender inequality to raise their voices and present testimony, bring awareness and advocate for fundamental human rights.